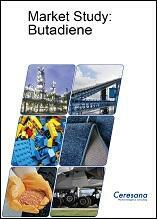 Butadiene has been indispensable for a range of important industrial and consumer products for decades. Even though maybe invisible to the eye of the consumer, this preliminary product of the petrochemical industry can be found in computers, carpets, and various rubbers. Its use in tires causes butadiene to be a basic product for the growing transportation industry. In 2012, however, indications multiplied that demand for butadiene declines due to slow economic development in downstream industries, the production of tires in particular. This was reflected in the price for butadiene, which fell considerably in all regions since the end of 2012. According to analysts at Ceresana, this slowdown will only be temporary; the market for butadiene is expected to grow again in the future. In 2020, approx. 13.7 million tonnes of butadiene will be processed by downstream industries. This market report covers all relevant data and facts regarding the butadiene market, market trends, market size and market growth. More than half of total demand for butadiene is generated by producers of styrene-butadiene rubber (SBR) and polybutadiene (BR) (SBR and BR are examined as well in the market study "Synthetic Rubber"). Almost 70% of these products are processed by the tire industry. Another important application is the engineering plastic acrylonitrile butadiene styrene (ABS), which is used in, for example, vehicle parts and casings for office equipment such as computers. Latex based on butadiene is utilized for carpets and paper coatings. Asia-Pacific has for some time now been the major consumer of butadiene and increased its share of the global market to more than 50%. This region is expected to continue to grow, development in individual countries, however, is likely to be heterogenous: China is projected to experience dynamic development, even though growth rates will not be as high as they had been in the past. The highest growth rate of more than 16% p.a. Ceresana forecasts for India, due to the rapidly growing processing industry in this country. Already saturated markets such as South Korea and Japan, on the other hand, are anticipated to generate only moderate growth rates. Until now, butadiene was mainly obtained as a by-product of ethylene production. Depending on the raw material used, the quantity of butadiene produced in steam crackers varies. In comparison to the crude oil-based naphtha, natural gas-based ethane contains little C4, causing butadiene yields in ethane production to be low. This is reflected in the USA, where innovative fracking technology has led to shale gas being increasingly used as feedstock. As a result, production volume of butadiene fell. Thus, relative availability of feedstocks influences production potential of butadiene. The market research institute Ceresana, however, expects low butadiene yields of shale gas to be overcompensated by an innovative method based on butane dehydrogenation. In the course of the creation of additional ethylene capacities, production capacity of butadiene increased considerably over the past years as well. Additional capacities met an increasing demand, which only slowed during the global economic crisis in 2008/2009 and reached a new maximum in 2012. In the future, the larger part of new capacities will be created in Asia-Pacific that also is likely to see the highest increase of demand. Ceresana does not foresee surplus capacities or continuing price erosion of butadiene on the medium- and long-term. Chapter 1 provides a presentation and analysis of the market for butadiene, including forecasts up to 2020: Demand development as well as revenues and production volumes are analyzed for each individual region. Chapter 2 examines the market for butadiene in the 16 largest countries in more detail: Data on demand, revenues, production, production capacity, import, and export is provided for each country. Additionally, demand is analyzed split by application areas. Chapter 3 offers a detailed analysis of applications for butadiene, such as Styrene-butadiene rubber (SBR), Polybutadiene (BR), Latex, Acrylonitrile butadiene styrene (ABS), and others (adiponitrile, acrylonitrile butadiene rubber, polychloroprene, styrene-butadiene block copolymers, methyl-methacrylate-butadiene-styrene, and other special chemical intermediates). Data is split by the sales markets Western Europe, Eastern Europe, North America, South America, Asia-Pacific, and the Middle East / Africa. Chapter 4 provides company profiles of the most important manufacturers of butadiene, clearly arranged according to contact data, revenues, profit, product range, productions sites, capacities, and summary profile. Detailed profiles of 80 producers are given, such as BASF, Braskem, ExxonMobil, Formosa Plastics, INEOS, JSR, Lotte Chemical, LyondellBasell, Petrobras Argentina, PetroChina, Royal Dutch Shell, SABIC, SINOPEC, Total, TPC Group, and Zeon.